(12:35 p.m. EDT) Norwegian Cruise Line has unveiled many of its 2021 itineraries, including details of Norwegian Encore’s inaugural Alaska season and Norwegian Joy’s inaugural season sailing to Bermuda, Canada and New England from its new home port of New York City. Itineraries are now open for booking. Continuing its commitment to Alaska, Norwegian will be basing three ships in the Pacific Northwest, including its newest ship, Norwegian Encore, which launches in the fall of 2019. In May 2021, it joins sister ship Norwegian Bliss in sailing seven-night cruises to Alaska from Seattle. Also in May 2021, Norwegian Jewel will return to Vancouver to sail seven-night Glacier Bay northbound and Inside Passage cruises. Norwegian Joy, which begins its inaugural Alaska season later this month, will move to the East Coast in April 2021. It will homeport in New York City for the first time, offering seven-night Bermuda and five-night Canada and New England trips. Here are more highlights of Norwegian Cruise Line's 2021 itineraries. Norwegian Breakaway will offer five-, seven- and nine-night Eastern, Western and Southern Caribbean cruises from Miami beginning in April 2021, after which the ship will reposition to New York in August 2021 to sail a series of seven-night Canada and New England itineraries. 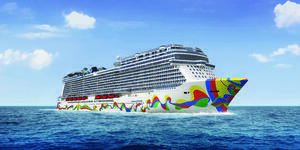 Norwegian Gem will offer seven-night cruises from Boston to Bermuda or Quebec City beginning April 2021. Norwegian Epic returns to Europe at the end of April 2021 to sail seven-night Mediterranean cruises, while Norwegian Dawn will sail the Greek Isles starting May 2021. Also at the end of April 2021, Norwegian Getaway will offer 10- and 11-night cruises to the Greek Isles and Italy from Rome. In the North of Europe, Norwegian Escape will feature nine-night cruises to the Baltic region starting in late May 2021. Cruise Critic will be onboard Norwegian Joy for its inaugural West Coast sailings later this month.